The value of all residential properties in Greater Vancouver has increased more than 100 per cent over the past five years. 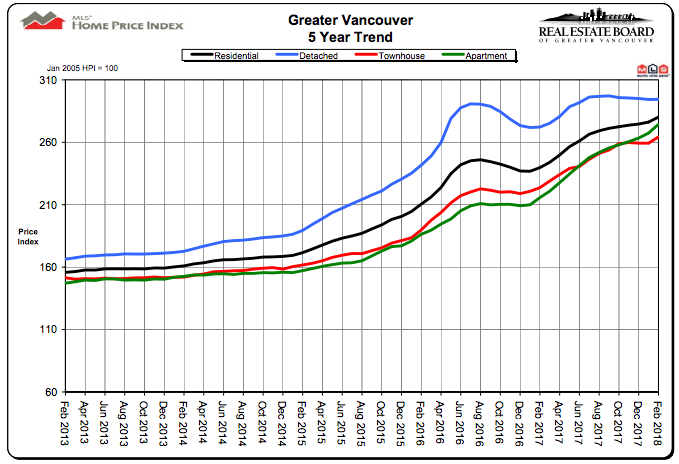 Last month, the Home Price Index (HPI) for all home types (detached, townhouse and condo) in the region was 280.2 — up 124.4 per cent from 155.8 in February 2013, according to the latest data from the Real Estate Board of Greater Vancouver (REBGV). “Prices do typically rise over the long-term. We have a lack of supply right now, particularly in the condo and townhome market, which has caused a very high sales-to-active listings ratio for those [property types],” Jill Oudil, REBGV president tells BuzzBuzzNews. In February, the benchmark price of a home in the region was $1,071,800, up nearly 80 per cent from $595,900 in February 2013. From 2013 to 2015, the HPI for all property types in Greater Vancouver grew modestly until the beginning of 2016 when the measures started to show significant growth. In August 2016, the residential HPI was 246 and the benchmark price of a home hit $941,000, a record 31.5 per cent year-over-year increase. Oudil attributes the peak in prices to tight supply and demand conditions in the market. “It was very busy at the time and we go through that type of trend quite often. It was peaking, although prices have still continued to actually rise from that point over the term,” says Oudil. Prices started to cool down in August 2016, after the BC government introduced a 15 per cent foreign buyer tax for Metro Vancouver. “There have been taxes that the government has implemented, such as the foreign buyer tax, that tend to cause hesitation with buyers, regardless if the actual tax has any impact,” says Oudil. Overall, home prices dipped to $906,500 in December 2016, but as consumer confidence began to strengthen, prices started to recover in the beginning of 2017. The HPI for all housing types has been increasing since 2017, yet prices in the condo and attached markets are escalating at a faster pace than the detached segment. According to Oudil, demand remains strong in the condo and townhouse segments because they offer a more affordable homeownership option. However, fierce demand continues to be met with limited supply, resulting in upward pressure on prices. “Right now, the sales-to-active listings ratio on a condo is 59 per cent, whereas a detached home is 13 per cent, or 11 per cent over the last couple of months, which is more into buyers’ market territory. That sort of explains it — it’s inventory versus the amount of buyers,” says Oudil.